On 17 May 2018 the exhibition “Arte Povera. A Creative Revolution” opens in the State Hermitage. 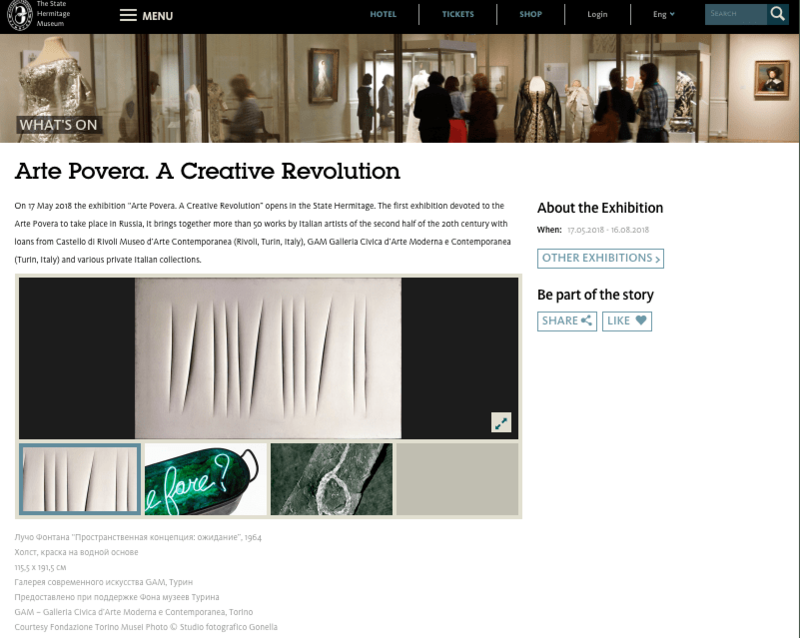 The first exhibition devoted to the Arte Povera to take place in Russia, it brings together more than 50 works by Italian artists of the second half of the 20th century with loans from Castello di Rivoli Museo d’Arte Contemporanea (Rivoli, Turin, Italy), GAM Galleria Civica d’Arte Moderna e Contemporanea (Turin, Italy) and various private Italian collections. The exhibition is organized by Castello di Rivoli Museo d’Arte Contemporanea (Rivoli-Torino) and The State Hermitage Museum with the participation of GAM Galleria Civica d’Arte Moderna e Contemporanea (Turin). The show is taking place within the framework of the Hermitage–Italy Foundation projects through the agency of Villaggio Globale International and is supported by the Lavazza company. Arte povera – “poor or impoverished art” – is a tendency that appeared in Italy around the turn of the 1970s. The distinctive feature of the movement became its members’ striving to move away from all-consuming technical progress towards artisanal creativity. Rejecting industrial and hi-tech materials in favour of “poor” and unaesthetic ones such as rags, newspapers or tree branches, the exponents of Arte povera were intent on liberating art from the fetters of traditionalism. Unwavering attention to the materials and processes of creative production became a common feature for artists who established a new aesthetic in European art. The term Arte povera was first used in 1967 by the Italian critic and curator Germano Celant. The display is housed in the legendary halls on the top floor of the Winter Palace, the decoration of which was also conceived at the turn of the 1970s. Today it seems that these rooms resemble in some elusive way the setting of the Kunsthalle in Berne – the venue with which international recognition of Arte povera began. The exhibition includes works by Giovanni Anselmo, Alighiero Boetti, Pier Paolo Calzolari, Luciano Fabro, Jannis Kounellis, Mario Merz, Marisa Merz, Pino Pascali, Giuseppe Penone, Michelangelo Pistoletto, Emilio Prini and Gilberto Zorio. Over the course of the 20th century Italian art repeatedly attempted to offer the established artistic system a fundamentally new vision of the creative process. Through the efforts of the Futurists, the Italian avant-garde sought to emphasise the connection between art and technological processes, the scope of which in the first half of the 1910s was capable of overturning people’s whole customary perception of the world. The industrial upsurge of that period prompted artists to seek new principles for the presentation of reality appropriate to the increasing pace of urban life. Almost at the same time, Giorgio de Chirico with his “metaphysical painting” adopted an anti-modernist position, accentuating the importance of craft principles of working as fundamental to art. Equally anti-technological were the contextual premises of post-war artists in Italy – Alberto Burri, Piero Manzoni, Lucio Fontana – which found reflection in the creations of the Arte povera movement. Works by those forerunners of Arte povera open the Hermitage exhibition. The strong economic boom in 1950s and ’60s Italy caused by the development of industry led to the establishment of a pronounced consumer culture. The fact that the exponents of Arte povera strove to resist a capitalist system that restricted creative freedom invested their art with political overtones. At the same time their works contained allusions to the historical past of Italy, a country that for many centuries gave the world outstanding masters of art. Arte povera was destined to be more than a short-lived local phenomenon. To a large extent this was due to the broad range of themes that the artists tackled. The complexity and multiplicity of strata in the creative gestures and the conceptual rethinking of artistic processes involved in Arte povera prevent the tendency from being regarded as exclusively reactionary. One of the reasons was the ability of the movement’s representatives to combine a critical reassessment of the country’s present with a romanticizing view of Italy’s past. All of this invested their works with a poetic lightness and an openness to dialogue. Despite the fact that the artists were connected by a number of features common to their work, each of them created his or her own recognizable style that is of independent artistic value. and although the movement existed officially for no more than a decade, its participants continued their original creative searchings in a now independent manner, without seeking to manipulate the term that united them. When people speak of Arte povera they usually have in mind works by specific artists created within a particular timeframe. The distinctive feature of those works is their “poverty”, that is to say, the emphatic simplicity of the materials chosen. The artists use ordinary objects that in everyday life evoke no associations with art. One more characteristic feature of Arte povera might be said to be the fundamentally new concept of the “product” of art, for which “vivacity” – the capacity to maintain the “energy process” – proves important. Many of the pieces included in the exhibition resemble autonomous systems capable of living their own life and asserting the self-sufficiency of the artistic gesture. The materials used by the artist, whether concrete (Anselmo, Zorio), factory products (Kounellis, Mario Merz) or mirrors (Pistoletto, Fabro) at the same time allude to both industrial manufacturing and to artisanal methods of working. Precisely 50 years ago the exponents of Arte povera brought about an incredible creative revolution, asserting the freedom of the language of art from adherence to any strict system, and they laid the foundations for a new aesthetic whose significance remains extremely high still today. The exhibition “Arte Povera. A Creative Revolution” is being held as part of the Hermitage 20/21 project that aims to collect, exhibit and study art of the 20th and 21st centuries. The exhibition has been co-curated by Carolyn Chrsitov-Bakargiev, Director of Castello di Rivoli Museo d’Arte Contemporanea and Dimitri Ozerkov, Head of the State Hermitage’s Department of Contemporary Art, with the assistance of Anastasiya Chaladze, a member of the department staff. This text and further informations on the exhibition can be found on the website of the State Hermitage.